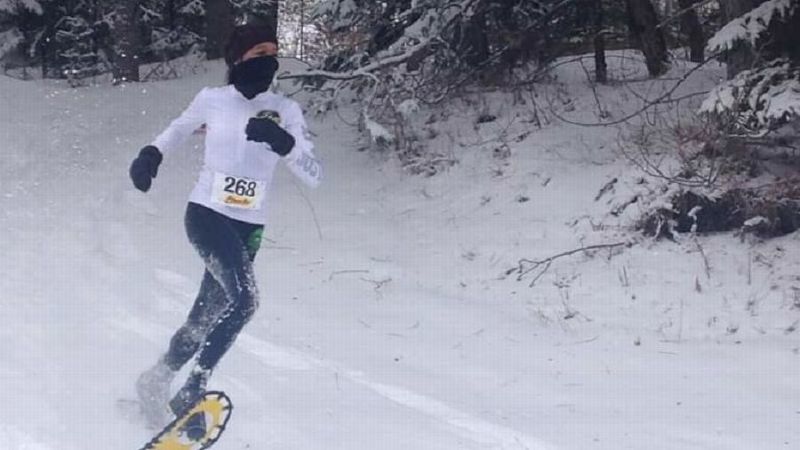 Ann Hirakawa has completed 22 marathons, but was unable to finish last year's Boston Marathon because of hypothermia. Ann Hirakawa was 13 years old when she and most of her family escaped war-torn Vietnam and arrived in the United States. Along with her mother, her grandmother, her brother and sister, Hirakawa was one of over 50,000 refugees that temporarily settled at Camp Pendleton in San Diego County, California -- and what she remembers most is how afraid she felt. 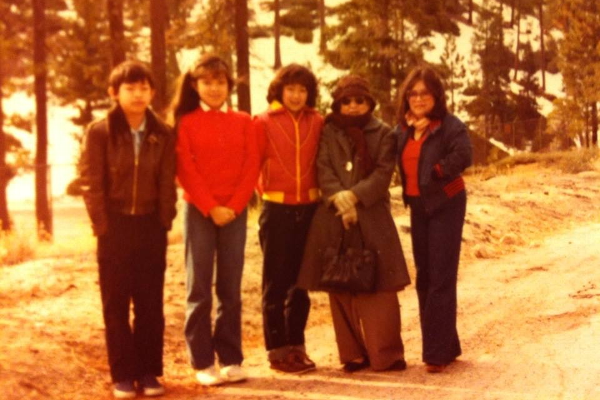 Ann Hirakawa (second from left) with her siblings, mother and grandmother at Palomar Mountain in Northern San Diego County circa 1982. Life at the military base was harsh. "Everything was contained. You have a certain bunk, you have curfews. I remember it was very cold," Hirakawa recalls. "And they warned us of rattlesnakes." Her mother, Kathy Pham, barely spoke English, and Hirakawa didn't know a single word. Then the American Red Cross came in. Along with basics such as food and clothing, the family was provided with English lessons. Hirakawa remembers the nurses with their white coats and skirts with the Red Cross emblem. She remembers fearing those who would blame them for American casualties in Vietnam, and a nurse saying, "Regardless of who you are, first and foremost you are a human being." And she remembers thinking, "They are angels." This year, Hirakawa is one of the 64 runners who will race the 2019 Boston Marathon for the American Red Cross, part of a team that together has raised more than a half million dollars for the organization. For many, running for charity is an easy choice. But for Hirakawa, it's also a deeply personal decision. She still has an olive green flannel blanket and a dictionary from Camp Pendleton. "That dictionary was our bible," she says. Her family was able to leave the base after three months, when another family sponsored them. But Hirakawa's father, a commercial pilot who had stayed in Vietnam because he had to finish his contract, wasn't allowed to leave the country as the family had hoped. Hirakawa's mother got a job and later a college degree, and the children went to school. But they struggled with learning English, and with bullying. "We had nothing," Hirakawa says. "We had to wear clothes three times over. People would make fun of us. I remember that very vividly. The kids were very mean." Hirakawa became a U.S. citizen at 21, earned college and graduate degrees, and got married. Then in 2008, she began a running career in perhaps the most unlikely way possible, when she signed up for the Los Angeles Marathon, four days before the race. She had no racing experience and didn't even have a proper pair of running shoes. Two days before signing up, Hirakawa had suffered from her third miscarriage. She and her husband, Howard, had been trying to start a family for almost 10 years, struggling to conceive through in vitro fertilization. Hirakawa was determined to become a mother, but after so many years of trying, she could feel herself becoming bitter. "It was a nightmare," she says. Then, on the way home from a doctor's appointment, she heard on the radio that there were only 31 spots left in the marathon. "I thought, 'Maybe there's a reason why I can't be a mom. Maybe I'm here to do something else.'" So she went for it. When her husband asked her if she was making a smart choice, she replied, "I need to finish something." On March 9, 2008, she took off for what she calls "26.2 miles of greatness." Until then, Hirakawa had ever run only four miles at a time. Still, it took 18 miles before she felt her legs breaking down. Then she slipped on a banana peel and fell hard. Held on an unseasonably hot day, runners were getting hosed down during the race, causing slippery conditions -- and slippery snacks littering the ground. Ann Hirakawa, with her twin daughters, Claire (left) and Grace, and her husband, Howard. "I looked down, and she had a prosthetic leg. And I said to myself, 'Oh my God, if she can run with one leg, what am I doing?' She got me through that hurdle, all the way through mile 22." She waited for the feathered woman at the finish line, but never saw her. "To this day, she's my angel," Hirakawa says. A month after the race, she found out she was pregnant with twins. 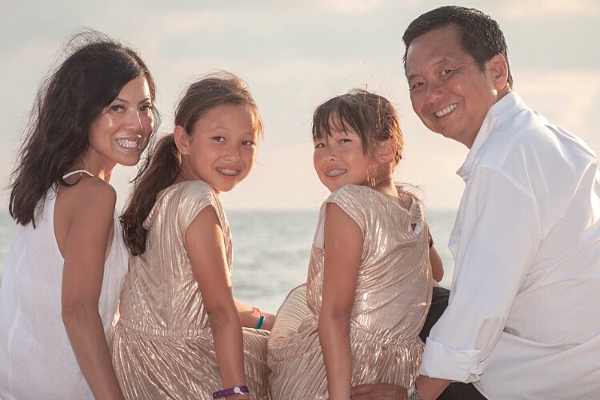 Her daughters, Claire and Grace, were born in December of 2008, and she didn't run another race until five years later, when Pham was diagnosed with breast cancer. Hirakawa turned to running to cope with her mother's illness, and she did plenty of it, completing five marathons that year alone. Before her mother died, Hirakawa made her a promise: "I remember telling my mom, 'Every race that I run going forward will be run in your memory, but I will seek out the Boston Marathon ... [and] I will do it for the Red Cross.'" 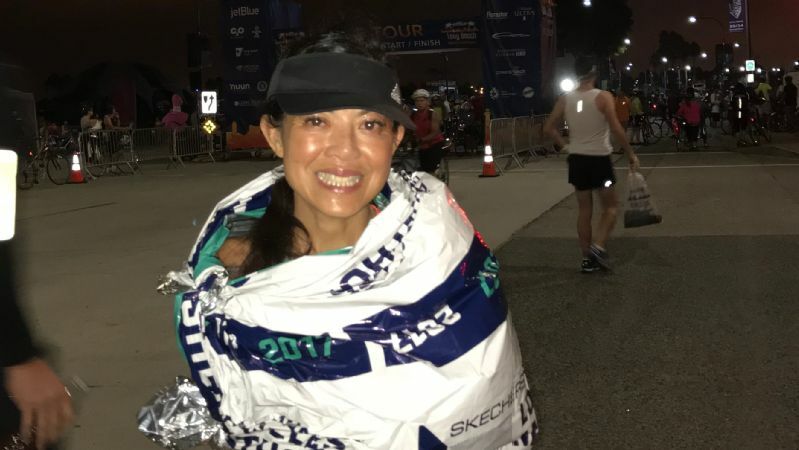 To date, Hirakawa has run 22 marathons with the help of her brother Paul, a four-time Ironman competitor. But the promise she made to her mother in 2014 eluded her until last year, when she joined Team Red Cross. Some of the most brutal conditions in the Boston Marathon's history threatened to keep Hirakawa from meeting her goal. 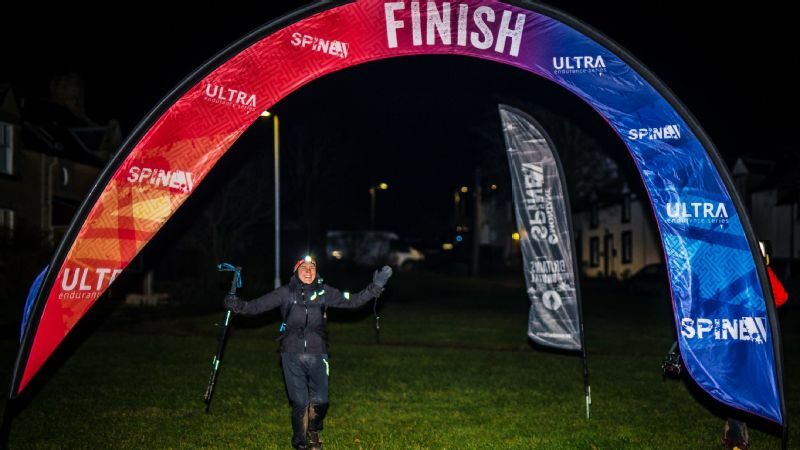 Cold, wind and rain brought down even some of the elite runners, with many dropping out due to signs of hypothermia. But she was determined: Hirakawa, who is 5-foot-1, and her running partner decided early on to use another runner -- a large man -- as a shield from the wind. Then, at mile 16, they saw him faltering. "I watched him zig-zagging, and all of a sudden, thump! He collapsed," she recalls. "I said, 'We're wearing the American Red Cross bib. We can't just leave him here.'" She helped him get to a medical tent, then started to leave to continue her race. But as she stepped out, she felt a hand on her shoulder. Despite her objections, the medical staff wouldn't let her leave because she also showed signs of hypothermia. At that moment, she realized her race was over. "The last time I felt that way was when my mom was diagnosed with cancer," she says. "I let down myself, I let my mom down, and I let down the Red Cross." While she has run other marathons since, including one just weeks later, the Boston Marathon still haunts her: "Every time I cross that 16-mile mark, it brings me back in time to that moment." On Marathon Monday this year, things will be different. She'll finish, she says, and she'll finish stronger than ever. "In a way, things happen for a reason. There's a reason why I helped that man, whoever he was. I helped him, but in a way he helped me to be a stronger person and to be more determined, and to say you cannot give up. The human spirit cannot be crushed."